Brandon R. Gumbiner, DPM, FACFAS, a member of the American College of Foot and Ankle Surgeons (ACFAS), says he’s noticing more and more overweight and obese children with foot and ankle pain in his examining room, mirroring a national epidemic of childhood obesity. “You want overweight children to exercise and lose weight, but because of their weight, their feet hurt and they can’t exercise,” says Dr. Gumbiner, a foot and ankle surgeon in Seymour and Columbus, Indiana. base of the toes, causing heel pain. strain and repetitive stress. Walking makes the pain worse. fractures (breaks) in a child’s heel bone. Foot and ankle surgeons treat many overweight children with custom orthotic devices (shoe inserts), physical therapy and other conservative measures to reduce or eliminate pain. 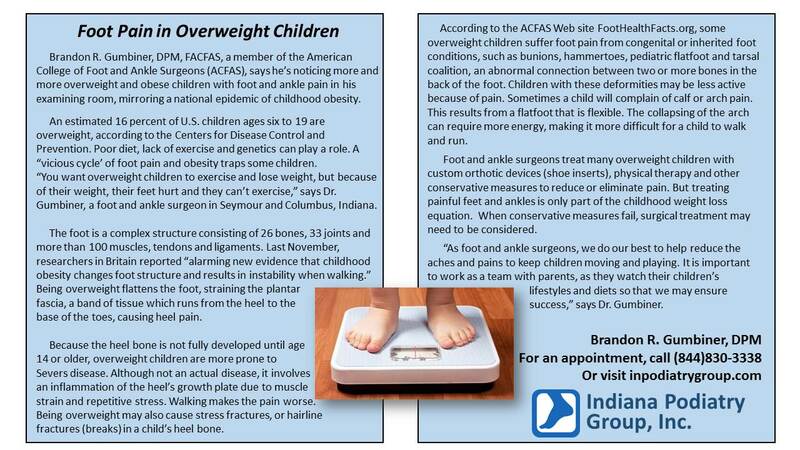 But treating painful feet and ankles is only part of the childhood weight loss equation. When conservative measures fail, surgical treatment may need to be considered. “As foot and ankle surgeons, we do our best to help reduce the aches and pains to keep children moving and playing. It is important to work as a team with parents, as they watch their children’s lifestyles and diets so that we may ensure success,” says Dr. Gumbiner.